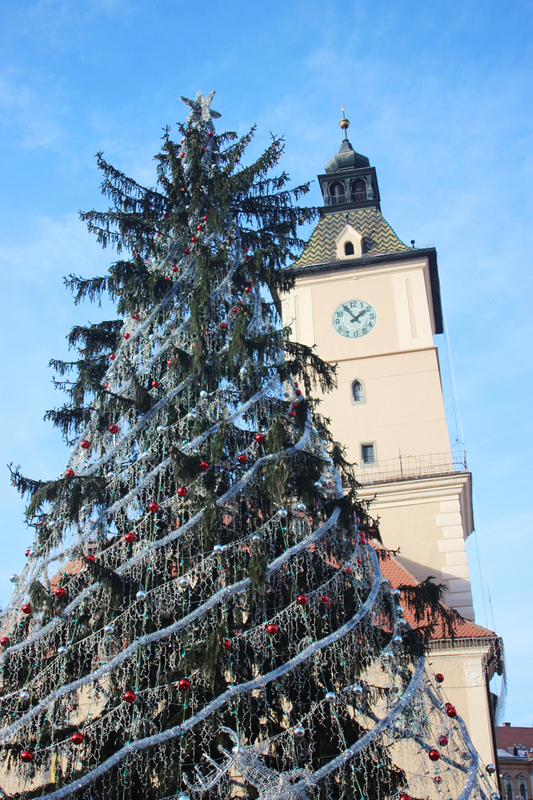 Greetings from Transylvania! Enamoured by the myth of Count Dracula, Henry suggested we take a Vampire Weekend to Romania. We've travelled to Rome, Vatican City, Lisbon, and Malaysia together over this year, and for winter we wanted to choose a country neither of us have been to. In the midst of contemplative confusion (living in London positions us among too many European countries to choose from) a decisive force in the form of a Uber driver by the name of Norbert arrived in his car to pick us from South London to ferry us back to Shoreditch and in the meanwhile took us to his homeland of Romania with his tales of vampire tourism, Vlad the Impaler's fearsome reputation versus the truth (no less bloody than the vampire stories), and the famous bear sanctuary in Brasov. So enchanted were we by Norbert's spiel that we hardly noticed our hour long journey in rush hour London traffic, and the moment we got home we booked flights to Romania for a long weekend. On Friday afternoon we arrived in Bucharest where we stayed for a night, this morning we took a rickety train to Brasov county in Transylvania where we've set up base in search of the truth behind the myth of Dracula, see for ourselves the origins behind the madness (I mean that as a compliment!) of the two Romanians (and also my two favourite people) I know, and explore this beautiful country which to even seasoned travellers remain off the beaten track thanks in part to communism in Eastern Europe. We stayed the night in Bucharest, which interestingly enough was nicknamed 'Little Paris' during the 1900s for the sophistication of its elite and the city's elegant architecture modelled after the original City of Light. Indeed, Bucharest has its own Arc de Triomph and the train station is also named Gara Du Nord. 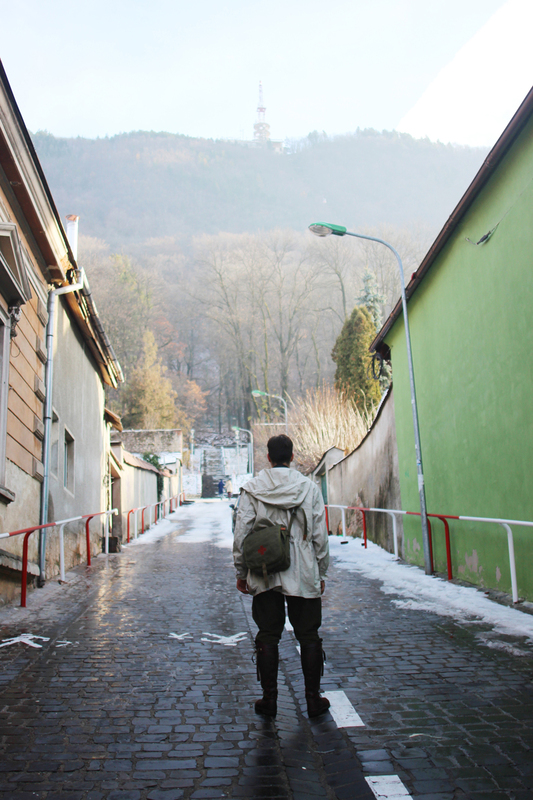 It was from Gara Du Nord that we took a train from the capital to Brasov, where many 'vampire tourists' start as a base to explore the region of Transylvania. The train fare for the two and a half journey (second class, don't bother with first, the only difference is the price) was a mere 50.50 Romanian Lei (RON) which at a favourable exchange rate cost us just under £9. 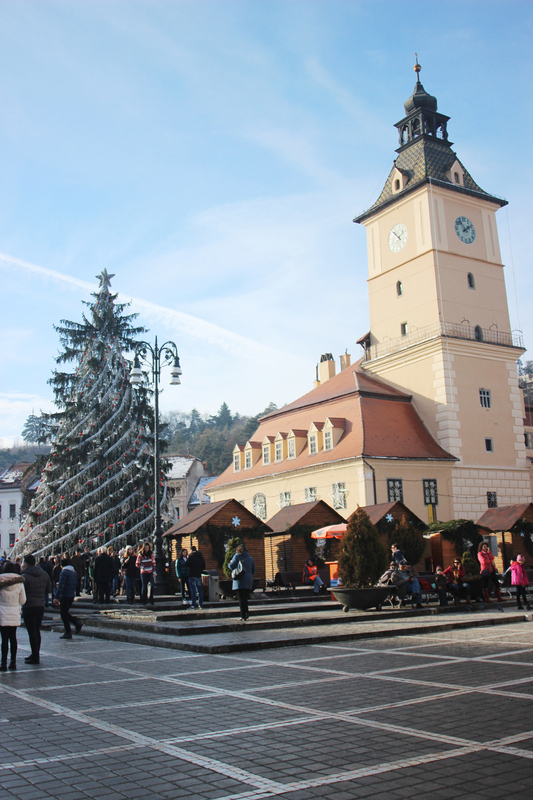 Brașov Council Square (Piața Sfatului), the focal point of medieval Brasov is rich with history and folklore. Tradition holds that the children sent underground by the Pied Piper of Hamelin appeared near this quare. Around the main square is a collection of medieval buildings in different architectural styles including the Black Church, an Orthodox Cathedral, and the picturesque pedestrian-only Republicii street where Henry and I set up camp. 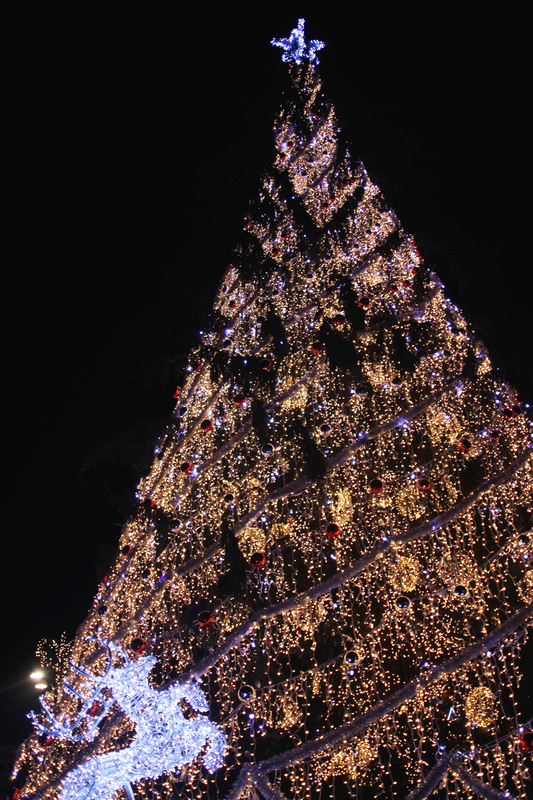 The behemoth Christmas tree in the town square was looking decidedly festive, and loudspeakers blared Mariah Carey festive songs that was heard clearly even from four hundred metres away in Mount Tampa. Black Church (Biserica Neagră) looking decidedly not at all black thanks to a vigorous scrub following the fire of 1689. This Gothic monument stands as the largest and one of the most important Lutheran (Evangelical Church of Augustan Confession in Romania) places of worship in the region. Thwarted by the slippery black ice around the church we barely made it to the front door and so skipped a visit to this most recognisable and revered landmark. Tâmpa Hill on the southern side of Brasov, where we took a cable car up to the top of Mount Tâmpa. 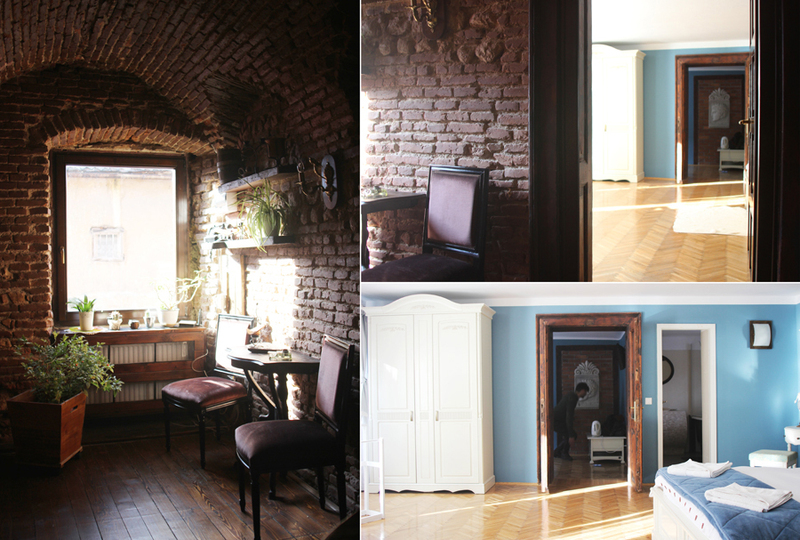 But first we checked into Casa Albert, a boutique hotel concealed in the heart of historical Brasov, just off the medieval pedestrian street down a charming red-bricked arched alleyway. I picked a suite (sweet!) for us. There were two suites, Red Room and Blue Room, and up till we arrived I had no idea which one we'd get. I was secretly hoping for the soothing and refreshing tones of Blue Room so I was delighted when we were opened the door to our humble abode! The room is furnished in reconditioned furniture for a vintage feel and the walls are painted with murals representing famous historical monuments of Brasov, giving us a glimpse into the city's history. We climbed our brick stairs up to our suite, Henry careful not to hit the top of his head on the low, arched ceilings, to our very own brick-walled reception which opened up the soothing blue walls of our abode. Below is the view of our reception area, the door to our suite, and a glimpse of our living room just past our bed. 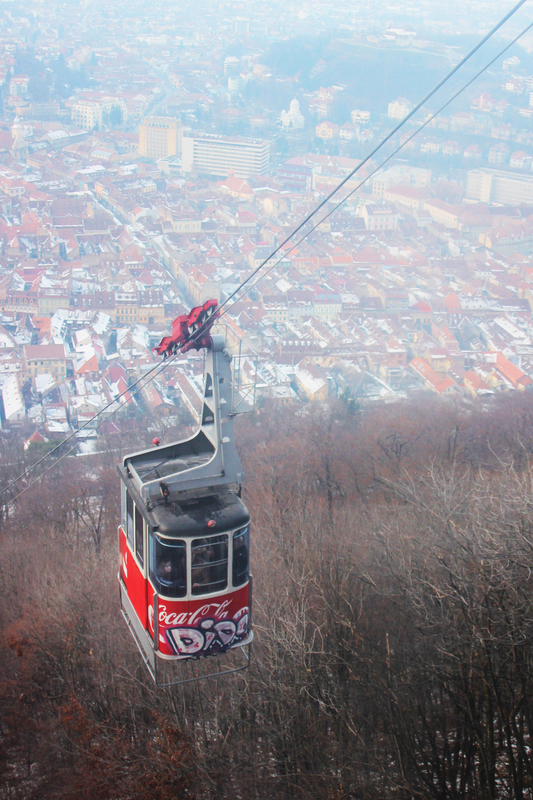 Henry and I took a stroll around the historical city (nearly slipping on slush and black ice about a hundred times) and climbed the arduous walk up Tâmpa Hill to board a cable car to the top of Mount Tâmpa for an elevated view of Brasov. Upon arriving at the cable car station I bemoaned my choice of footwear (Stuart Weitzman 5050s weren't made for climbing icy mountains with steep drops) but then saw a glamourous Romanian yummy mummy, child in tow, strutting defiantly through the ice in her four-inch high heeled boots so I shut up. Although that did nothing to quell the fear that I would slip and fall four hundred feet to my death. It took our breath away. Literally, because my foot slipped on ice and I nearly went plunging downward. Even up here we could hear the Christmas music wafting from the town square. 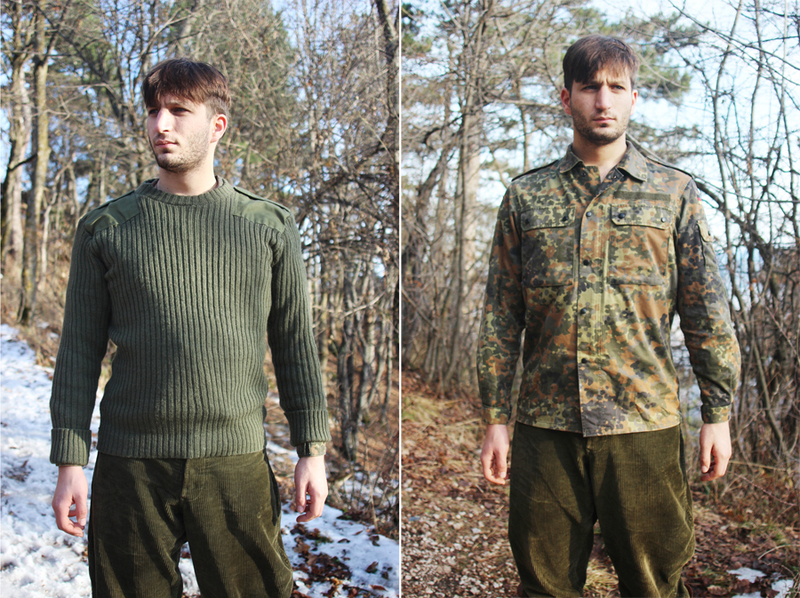 Relieved that the worst was over, Henry and I took advantage of the scenery and did a quick photoshoot for our baby: our online shop Regimental Vintage which we were quick to put up in the shop as soon as we got back to the hotel after dinner. Because when you work for yourself, you never stop working. What's a holiday? Oh, these...I remember those. 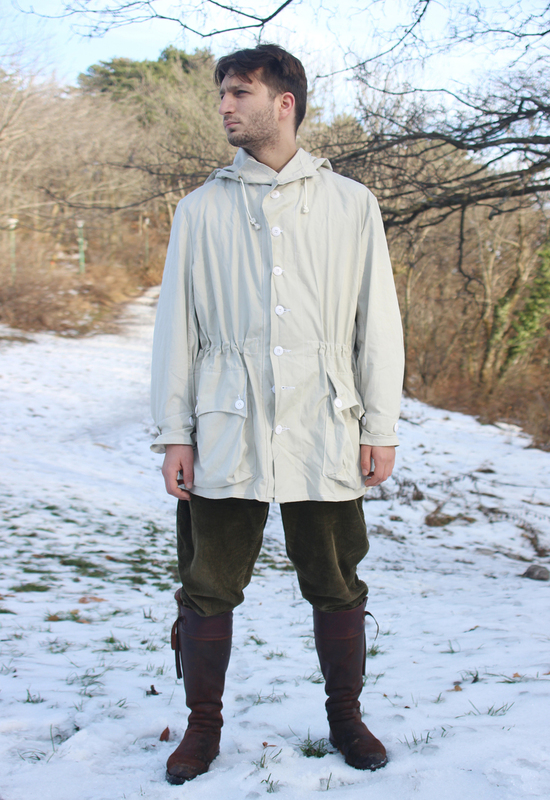 New stuff on Regimental Vintage. I love how the photos turned out! I'm now so obsessed with shooting stock wherever we travel. I can't believe I didn't think to do it while in Malaysia. Can I justify taking holidays just for photography? Oh wait, I sort of already do. I didn't choose the hood life. The hood life chose me. Can I please talk about my latest lifesaver that is the Uniqlo down coat? Not to be confused with Uniqlo's famous ultra light down (the one you roll up into a tiny bag) this ridiculously comfortable coat is a miracle of engineering and frankly magic. It weighs like a handful of feathers (goose down, actually) and its lightweight is perfect for travelling: none of that heavy, sweaty, overheated nonsense (how terribly unrefined) that lugging a heavy coat over your elbow while dashing through an airport or catching the train. 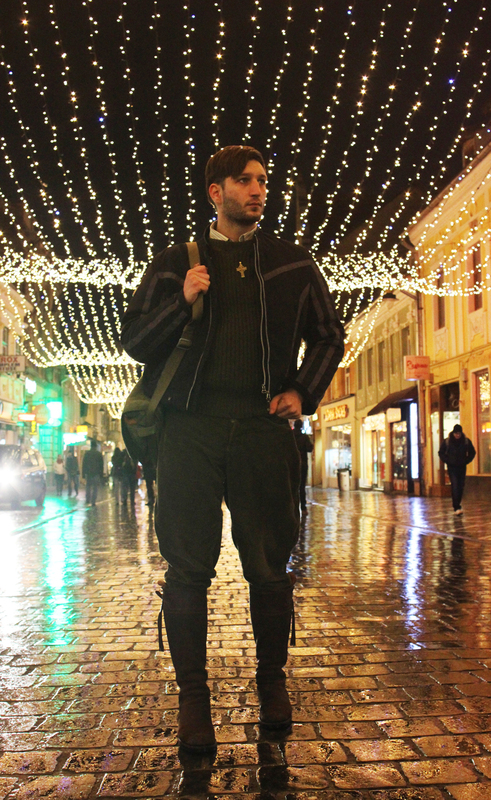 I've not felt cold a single time Brasov has reached subzero temperature even though I'm only wearing a single Heattech turtleneck underneath (no jumper, no shirt, nothing!) and Heattech leggings under my American Apparel riding pant. Whatever sorcery this is, I applaud it. 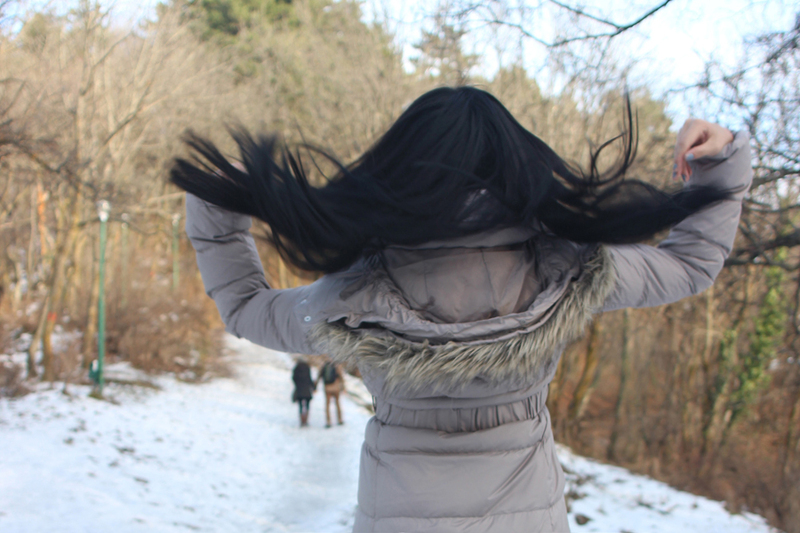 If a creature from a tropical country like myself can handle a Romanian winter, snow and all, in just one layer and a coat so light you can barely feel it, than I daresay it wouldn't hurt to live in Uniqlo's amazing heat-retaining basics all winter. That, and both the collar and the faux-fur trim is detachable. Did I also mention that taupe is one of my favourite colours? I better stop my raving before this post becomes a Uniqlo praise forum. We descended Mount Tampa for a very late lunch, or early dinner, in an Italian restaurant just off the town square. I can't quite remember which one, but you can't miss it, it's a giant glass box that looks just like a greenhouse. The food was quite good, certainly the pasta made a welcome change from the fat-saturated pork knuckle I had for dinner in Bucharest the night before (but that is another story). Bistro de l'Arte is tucked away in a little courtyard moments away from the hustle and bustle of Brasov square. 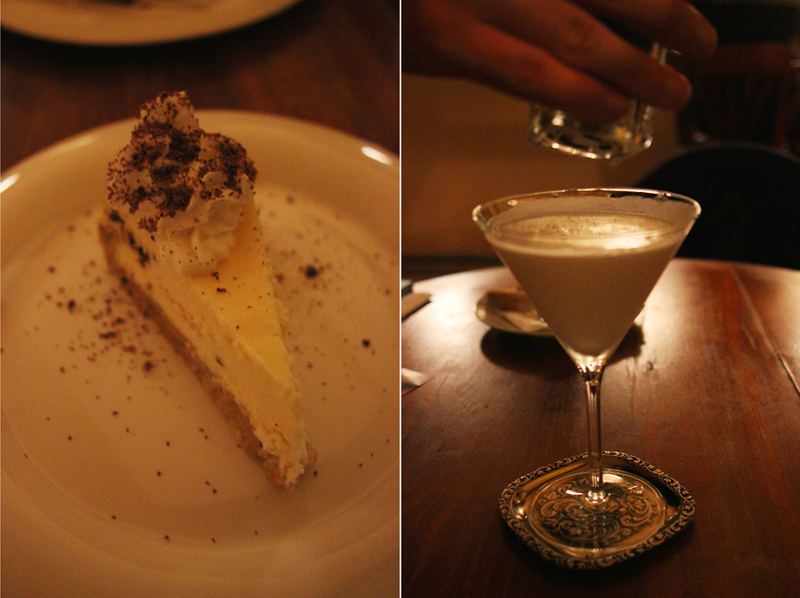 With the pianist tinkling away to the atmospheric lighting, the place certainly was cozy and intimate. 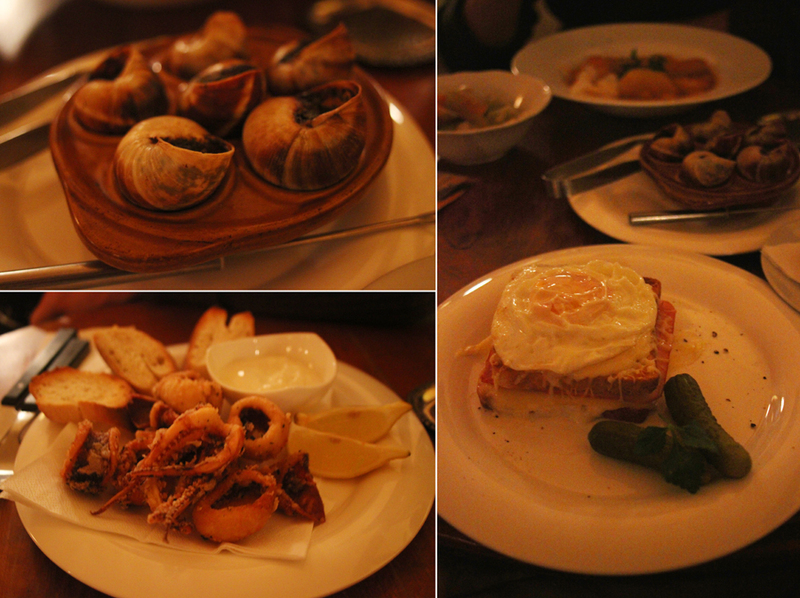 Having decidedly, sadly, that Romanian food was not for me, the French offerings were very welcome. Henry and I shared escargots and calamari, he had a Romanian potato stew while I nibbled daintily at my croque madame before eschewing all properness (and any attempt at seducing him) and tearing into a pistachio cheese cake before washing it all down with a sort of creamy Kahlua cocktail spiced with pepper.